Why do you need a crate? 1. How long is too long to leave a dog in a dog crate? 2. Where is the best place to put a dog crate? 3. My new puppy cries in the crate at night, what do I do? There are a wide range of crates on the market, each with different designs and looks, but what is the best crate for your dog? Some of your decisions in choosing a crate will depend on your preferences, while other aspects are important for your dog. You need a crate that is big enough for your dog to stand up fully and turn around comfortably, but not so big that she will have room to eliminate within the crate. Sleeping in a crate will stimulate your dog’s natural instinct not to go potty where she sleeps, but only if the entire crate area is used for sleeping. Learn the best way to crate train your dog before you take her home, so that your life together will begin smoothly and safely. Crate training should not be a difficult or stressful process for either of you, but it does take time and commitment to schedule. Why do you have to put your best friend in a crate? You are getting a dog so that you can form a relationship, and at first glance asking your dog to go into a cage doesn’t seem helpful to that goal. In fact, giving your new dog her own space helps her feel secure and safe in your home. While a crate may not seem very attractive to you, your dog will naturally seek a dark, covered space. If you provide a crate, especially with a covering over it and plenty of soft bedding inside, your dog will very likely find it on her own. You don’t know your new dog yet. Depending on her age, she has had a lot of time to form habits and behaviors that may or may not go well with your home. If she is a puppy, your dog may not yet have learned appropriate behavior or developed self control. 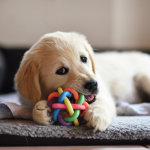 Your new dog may not know that she shouldn’t chew the couch or rug, or that grabbing food off of the counter or out of cabinets is inappropriate. Even if you close your dog in a room or enclose her in a space, you may be surprised by the things she can get into and the sorts of enclosures that she can get out of. Crate are designed to safely contain your dog, so that she won’t hurt herself trying to get out or getting into something unexpected. Trainers, shelter staff, and veterinarians recommend that you crate train your new rescue dog. The best dog crate for your rescue dog will meet the Association of Professional Dog Trainers’ specific parameters. The best large dog crates will collapse for easy storage and transport, while the best small dog crates will comply with airline guidelines so travel is easy. There are lots of crates on the market, and it can be hard to decide which is right for your dog. Here are the best crates you have to choose from, as well as what dogs they are appropriate or. While there is no best dog crate for separation anxiety or other behavior problems, the right crate can help you through the training process. This is the most common dog crate in use. Wire crates are affordable and durable. They allow plenty of airflow and are easy to clean. Wire dog crates can also collapse, so that they can be conveniently stored flat. 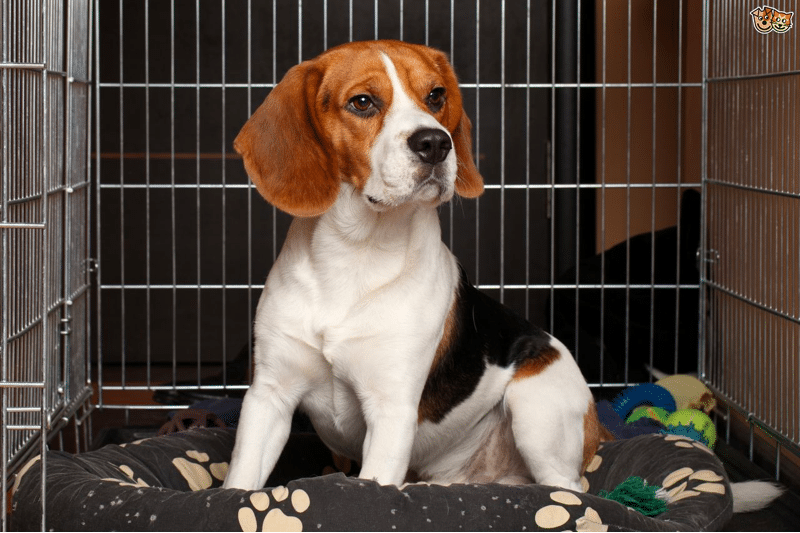 The best wire dog crate will have a pan at the bottom that is securely latched in, so your dog won’t scratch it out and be left standing on the wire. You can choose a wire dog crate for any size dog. There are usually two doors, so it is easy to situate the crate in the best way in your home. Most wire crates work by either a lift tab or sliding latch. Wire crates with sliding latches are best for rescue dogs, since many rescue dogs know how to lift the door of cages with a lift tab and let themselves out. Wire crates are good for puppies because they often come with a divider so that you can adjust the size perfectly for your growing puppy. The MidWest Homes for Pets Dog Crate is a quality metal crate with two doors and a latching lock design. It comes with a divider so that if you have a puppy you will only need to buy one crate for her entire life. A sliding crate pan makes cleaning up easy. The pan is latched in so your dog won’t scratch it out and leave herself standing on the bars. A carrying handle makes transport easy, and roller feet protect your floors, even if your dog moves around. This crate comes with a year warranty, so you can feel confident about your decision. Plastic crates are the best travel dog crates, but there are good arguments for using them as a primary crate as well. Plastic crates provide a more enclosed den-like feeling without needing any additional coverings that your dog may be able to pull into the crate. Plastic crates are very secure, and it is highly unlikely that your dog will be able to open a fully bolted plastic crate. The door requires pressure from up and down simultaneously, which a dog simply can’t accomplish from inside. Furthermore, fully rounded edges prevent any tooth hold, and the wire grate is tighter than in wire crates, preventing your dog from chewing on the wire. A plastic crate is the best dog crate for car travel, since it can make your dog feel safe and secure, while also containing any mess if your dog gets car sick. Cleanup is easy just by wiping down the crate and changing bedding. 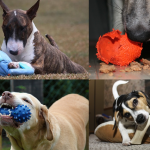 If your dog likes to use a food or treat dispensing toy in her crate, a plastic crate can prevent the kibble or treats from ending up all over the floor and frustrating you and your dog. The completely enclosed plastic bottom tends to keep mess more contained than in wire crates. The Petmate Ultra Vari Kennel is a durable, heavy duty plastic crate that can safely contain your dog while making her feel safe and secure in the enclosed, den-like design. Ventilation windows are provided on all three sides, for improved ventilation compared to other plastic crates. These windows are firmly bolted from the outside, so that your dog won’t be able to get a tooth into them. The crate is made of recycled plastic, so you can feel good about this eco-friendly purchase. 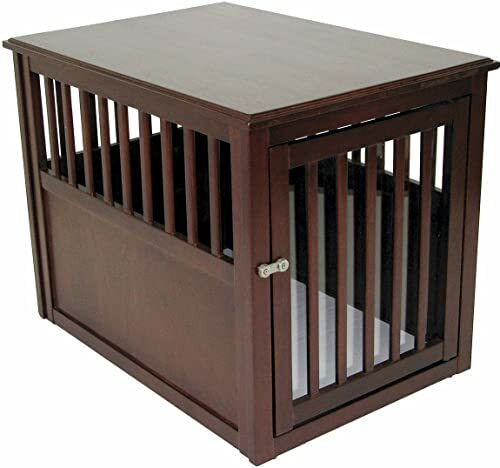 Soft-sided dog crates are not appropriate for leaving any dog unattended, but if you are around your dog all of the time and just want a comfortable, enclosed place for her to call her own, a soft-sided crate can be a great choice. The mesh sides are soft and comfortable for your dog to lean against, unlike hard-sided crates. The mesh also provides great ventilation while still offering a secure environment that will feel pleasantly like a den to your dog. 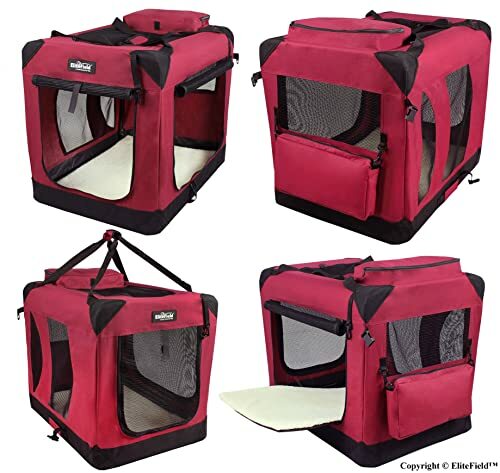 These are among the best small dog crates, especially for little dogs that are nervous when traveling. 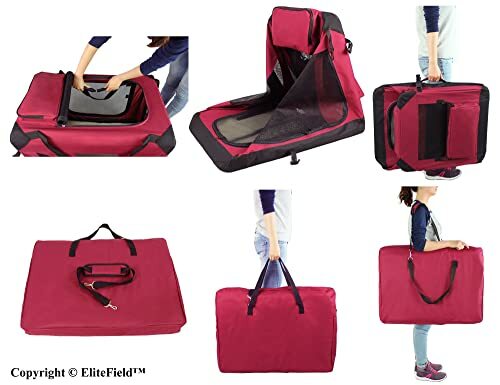 They often come with carrying handles so that you can comfortably take your dog out in the crate so she can acclimate to environments and situations from the safety of her own crate. Typically you can collapse and conveniently store soft-sided crates flat. The EliteField 3-Door Folding Soft Dog Crate is a great option, especially for smaller rescue dogs. It comes in a wide range of colors so that you can match the fabric portion to your home decor. The sturdy 600D fabric and hex mesh design will look much nicer in your home than the typical plastic or wire crate. This crate comes with carrying bag and even a fleece bed, as well as a handle and hand carrying strap, so that you can conveniently carry this crate open or closed. 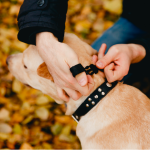 You can bring it on all of your outings with your dog, so that she can have a home away from home anywhere. This is one of the best dog crates for camping that you are likely to find, since it will also protect your dog from bugs while still letting in the breeze. A two year warranty offers you peace of mind in your purchase decision. If you know or suspect that your dog is an escape artist, or if your dog could be dangerous to people or other dogs, you will want to make the investment into a heavy duty dog cage. A sturdy steel crate with thick bars can keep your powerful dog from escaping. A powerful, determined dog can chew and twist the wire of a normal crate, or use their weight and strength to bend bars or break open plastic. Heavy-duty crates can’t be bent or broken, and a secure latch will keep your dog from opening the door. 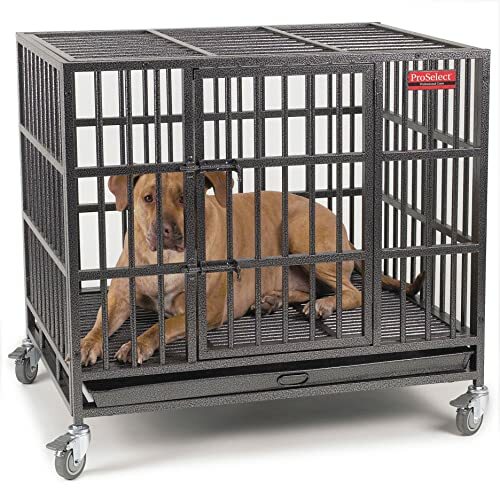 The best heavy dog crate will have wheels so you can move the heavy crate with a dog inside. You should never leave your rescue dog in a crate if she is fearful or anxious, but for dogs in the training process, especially dogs who could be a threat to others, a secure heavy-duty crate is a necessity. 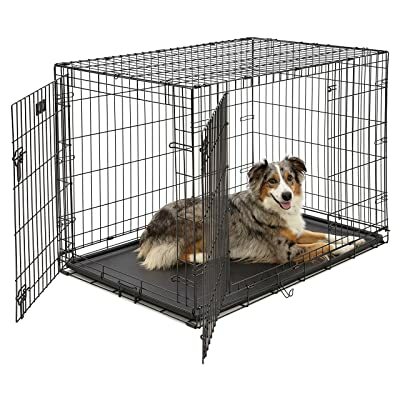 The Guardian Gear ProSelect Empire Dog Cage is made of 20 gauge steel that will withstand even the most powerful jaws. Bars are half an inch thick, and won’t bend or wear due to chewing. The floor is grated, with a pull tray underneath. If you are dealing with a dog with severe aggression that is in the training process, this may be the only way to keep her clean for a time. Put a thick indestructible dog bed for crates in so your dog won’t have to lie on the bars. 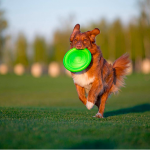 Removable caster wheels let you move the cage around, which can be especially important if you are moving the dog into and out of a training area. This sturdy crate is a secure place to keep your potentially dangerous dog during the training process. 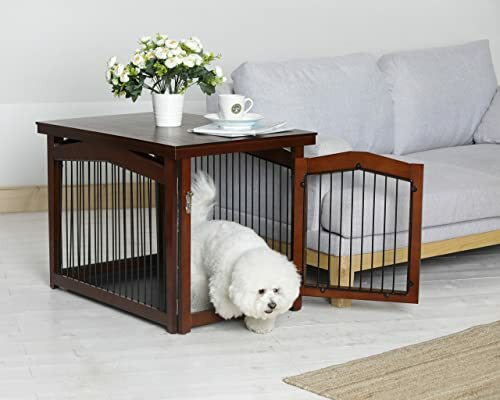 You want your dog to feel like a part of your family, and so of course you want her favorite place to be near where you spend most of your time, but you cringe at the thought of a big ugly crate in your living area. A fashion dog crate is a great solution, offering your dog a secure and comfortable place near you, in a discreet design that will look great in any space. Generally fashion crates are designed for dogs that don’t chew, and that will be under supervision most of the time, so keep that in mind when making your decision. It is best to only consider a fashion crate once you have a sense of your dog’s destructive tendencies, or if you will be able to watch her all the time that she is in the crate. The Crown Pet Products Wood Pet Crate End Table is a great choice for the stylish dog. You can choose between espresso and mahogany stains to customize the crate to your space. This is a wooden crate with wide bars that will certainly give in to a determined dog’s chewing, so it is not appropriate for chewers or a dog that you don’t yet know well. It’s a great choice for older dogs. Finish your older dog’s bed with an orthopedic dog bed for crates so that she will sleep as comfortably as possible. Your guests won’t even notice your dog resting comfortably in her stylish crate disguised as an end table. Get a lovely additional surface for your space and a place for your dog to sleep in one purchase. The floor is waterproof due to safe melamine covered MDF, so you won’t have to worry about liquids or odors being absorbed. Choose between two sizes for the right fit for your home and dog. The door can swing in or out, so that it can be discreetly tucked away. Maybe you want a crate sometimes, but other times just want to pen your rescue dog into one part of the room. Why buy two pieces when you can get a convenient two for one convertible piece? 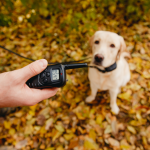 If you are with your dog most of the time and are in the process of getting to know her and training her what behavior is appropriate, you will likely find it convenient to sometimes put her in her own space so you don’t have to worry about her, and other times keep her in a space with you so you can observe and correct. A convertible crate gives you the versatility to do both jobs easily, without having to store extra equipment. The Merry Pet 2-in-1 Configurable Pet Crate n Crate offers the best of both worlds, in a stylish design that will also look great in your space. The wooden top and sides make this piece blend into your room as an attractive end table. 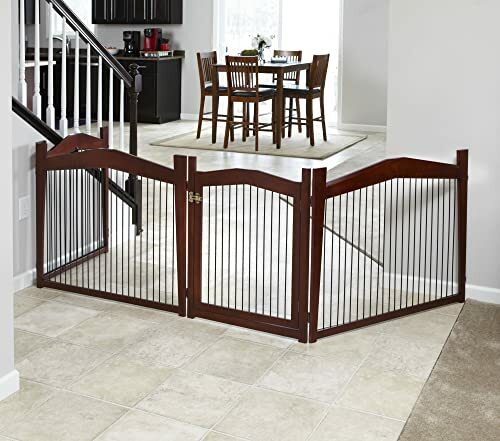 When you want to use it as a gate, just remove the top and the bottom tray and you can stretch the gate out to block any doorway or create a small pen. The door becomes a latched gate so you can easily go in and out of the confined area. The simple straight up and down wire and wood construction looks great, but won’t hold up to dedicated chewing, so only choose this product if you can observe your dog. It can be hard to determine what is an appropriate amount of time to leave your dog in the crate. Most adult dogs are happy sleeping in their crate for eight hours or even a little more overnight, but it is a good idea to check on your new dog during the night to make sure she is sleeping well and doesn’t need a bathroom break. If you are potty training a puppy, you will need to let her out every four hours or so, for the best chance of successful potty training. To determine what length of time your dog is comfortable within the crate, keep a careful eye on her at first as you increase the length of time she spends in the crate, and make sure she always has plenty of chew toys, food dispensing toys, and fresh water. Ideally your dog’s crate will be near where the family spends most of their time, but not central. The corner of a living area or kitchen is a good choice, as is a room that opens onto a living area. 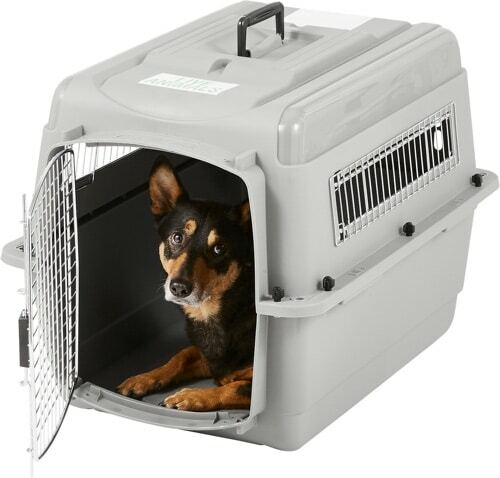 You want the crate to be somewhere your dog can retreat to to have some alone time and be out of the way, while still allowing her to feel like she is part of the family. It is perfectly normal for a puppy to cry at night. Your puppy is dealing with the stress and anxiety of being alone for the first time, and is missing littermates and her mother. A hot water bottle can help to comfort your puppy, as can clothing and blankets that smell like you. Make sure you take your puppy out to potty at least every four hours, so that you know she isn’t crying because she needs to potty. If you are confident that your pup doesn’t have to go out, just put in some ear plugs and get through it. Most puppies stop crying within the first week or couple weeks in their new home. Never reprimand a puppy for crying, as it will only increase her confusion and sense of loneliness, while also hurting your developing bond. Crate training is an important part of your life with your dog, and the right crate can help make this process go as smoothly as possible. There are a lot of crates to choose from, but whether you want a high security crate for a new rescue dog or a soft sided travel crate for your small puppy, you can find the perfect crate for your dog’s needs.